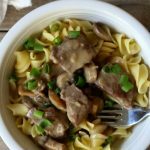 Instant Pot Beef Stroganoff–a super easy recipe for beef and mushrooms with a zippy sour cream sauce made quickly in the pressure cooker. Do you want something super easy that you can just throw together in the Instant Pot and move on with life? This is the recipe for you. Just throw beef, mushrooms, cream of mushroom soup, onion soup mix and water in the pot and you’re good to go. If you aren’t a fan of cream of soups and packets of onion soup mix I’ve included a less processed version of the recipe below the original recipe. After the meat cooks until tender, you’ll add some sour cream to give it that zippy taste. 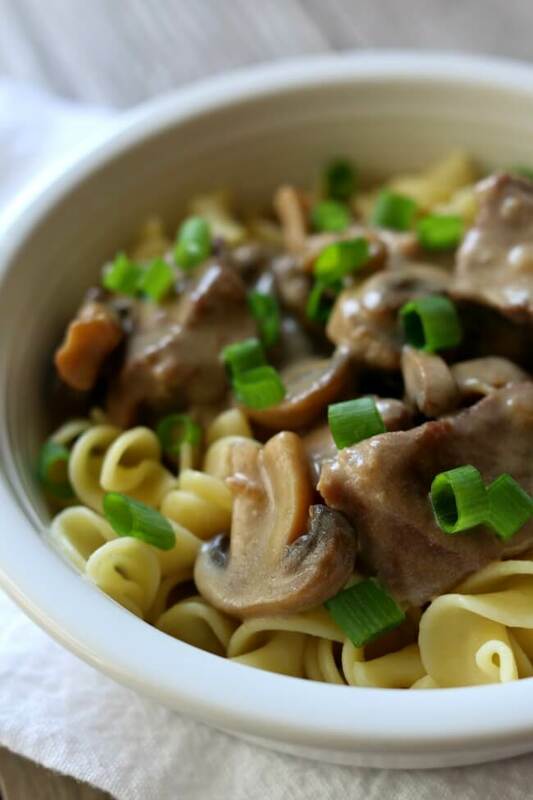 We love to serve our instant pot beef stroganoff over egg noodles. But if you want, you could serve it over rice or mashed potatoes. 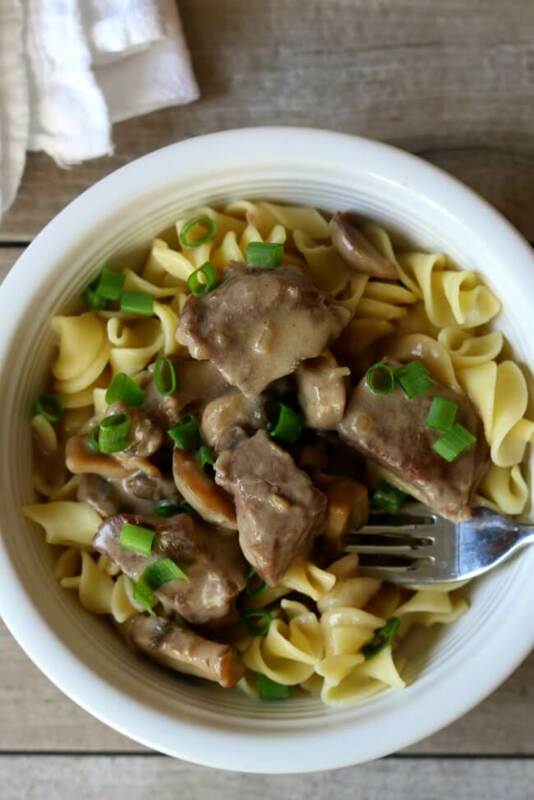 For this Instant Pot Beef Stroganoff I used my 6 quart Instant Pot Duo 60 7 in 1 for this recipe. I also own the 6 quart Instant Pot IP-LUX60 V3 Programmable Electric Pressure Cooker. They are both great pressure cookers! The first one I mentioned has a yogurt making function but other than that they are fairly similar. The price difference between the two is about $20. 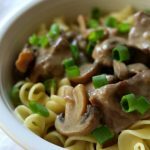 A super easy recipe for beef and mushrooms with a zippy sour cream sauce made quickly in the pressure cooker. Add stew meat, mushrooms, mushroom soup, onion soup mix and water to the Instant Pot. Stir. Remove the lid and stir in the worcestershire sauce. In a small bowl stir together the sour cream and the flour. Stir the contents of the bowl into the Instant Pot. Turn the Instant Pot to the saute function. Stir until the sauce thickens. Serve the beef, mushrooms and sauce over the noodles. Garnish with green onions. If you’d like a “no processed version” of this recipe scroll down. This is a version of the recipe above but it has less processed ingredients. Add the beef to the Instant Pot. Stir in the powdered milk, garlic powder, salt, onion powder, beef base, pepper, basil, parsley, dried onion and water. Add in the mushrooms. Salt and pepper to taste. 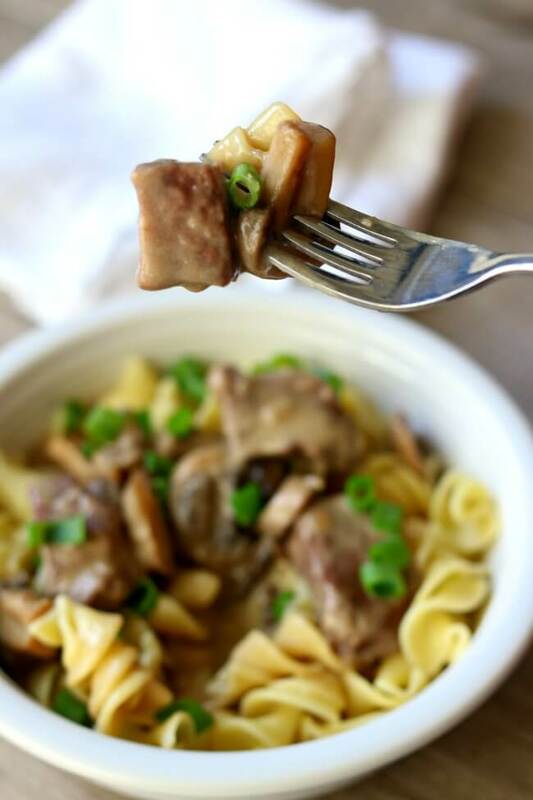 Serve the beef, mushrooms and sauce over the noodles and garnish with green onions. Could you substitute chicken for the beef? And if so would the cook time be less or the same? Yes. If it was chicken in pieces you would only need about 5 minutes of cooking time. Maybe even less than that. Do you use fresh mushrooms? If I want to make this as a freezer meal, would I combine all the ingredients from step 1, and then cook as directed? Will the mushrooms hold up in the freezer? I think they will do fine. That is what I’d do! How could I adjust this recipe for frozen stew meat? Thank you! Just keep the cooking time the same. It will just take longer to come to pressure if it is frozen. I have noticed that your roast recipes don’t have us browning the meat on sauté before pressurizing them. I’ve been doing that when I cook meat in it and it usually tastes great. Do you not think it makes a difference? If I brown it first, do I reduce the cooking time? If you take the time to brown the beef it will definitely have a better flavor! Sometimes I am just too lazy. Don’t worry about changing the cooking time. It will be the same, or similar. Could I use ground beef instead of stew meat? I think you could, but you would need to cut the cooking time down. I’d highly recommend trying this. The beef was super tender after 15 minutes, done to perfection. I didn’t have dried onion on hand, so substituted dried garlic and it was fine. so happy to hear this! Thanks so much Christine! I have made in my pro pressure cooker.all ingredients.except i brown meat.add the rest.and egg noodles cook on 7 min on fish/veggie cycle. Thanks for also posting the no processed version. I don’t always have a can of soup on hand 🙂 Love your recipes!! Your daughter did awesome in this video, I loved catching it on Facebook! She is soooo adorable…a budding cook! I just saved this recipe, as I have so many of yours and have shared your site with friends too. Hi. Is there any way to make the noodles, rice, potatoes (mashed) at the same time? Or is it just easier to make them separate? Thanks! Love how easy this is! Thanks for linking to my recipe.